A carbon filter is a tool that is used for the removal of impurities in the external environment. Its vital function is odor management. The carbon filter tends to exist in many forms, for example, the carbon block water filter. Today, we will be dealing mostly with carbon air filters. 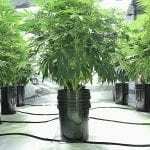 The carbon air filters are used chiefly in the growth of indoor plants like the cannabis where some fertilizers, pesticides, and nutrients are used. Investing in carbon filters might sound like the most absurd thing. But the foul smells that sometimes seep into the outside, make purchasing a carbon filter one of the best investments you can make. Carbon filters exist in two forms. The first of the filters is a carbon only filter while the second is more of a carbon filter fan combo. In this last case, it is both an inline and an exhaust fan. Talk about dual capabilities in one. The filter mostly takes a cylindrical form, and it makes use of deoxygenated carbon. It tends to use highly porous charcoal for air to pass through and the odor trapped. When selecting a carbon filter, you should consider various factors. We summed these factors up for you. Activated carbon adsorbs to its surface. Hence when fully adsorbed, the capability to be useful is depleted. Also, the amounts of pollutants being adsorbed, a small amount of carbon can be consumed within weeks making the filter useless. Therefore, the number of odor produced will influence the amount of carbon in the filter one can purchase. The more contact time carbon has with a pollutant, the better chances there are for the odor to be adsorbed. Also, the thicker the carbon filter the better the adsorption. Thin carbon filters that are used in low-priced air filters are not the most effective in removing chemical fumes or odors. This activated carbon’s hardness makes the filters cleaner than other filters. This gives these filters a longer life expectancy. They are further divided into three groups depending on their general sizes, which include Micro-pores, Meso-pores, and Macro-pores. The pre-filter is used to reduce particles like dust from getting into the air filter. The pre-filter not only improves the lifespan of the filter but also helps in keeping the inline equipment or fan in check. The portability of the filter refers to how quickly the filter can be moved. In the purchase of the carbon filters, filters that are compact tend to produce lesser noise and vibrations. They tend to be more efficient in their works as well. This refers to the longevity of the filter. Most people would opt for the cheaper option without remembering the infamous saying that cheap is expensive. In this case, going for a more expensive filter will be a better choice due to its (often) higher quality. The expensive filters tend to last longer and have low maintenance compared to their cheaper counterparts. How to pick the right size for your carbon filter? The video below describes it all for you. We have reviewed six of the best carbon filters that are available. If you are looking for a good carbon filter to keep bad odor in control, you should check out these options. This model of the filter comes with a 4-inch flange ducting, which has a length of about 12 inches. The filter uses the Australian RC 412 that is activated by carbon to absorb pollutant molecules. The airflow is 1200 CFM. Its superior performance is pinned to the 1050+ IAV charcoal which happens to be one of the best in the world. It has an open-air mesh that allows maximum airflow and cleaning capability. Its open area is 53% which maximizes the airflow making it the most effective filter for odor management. 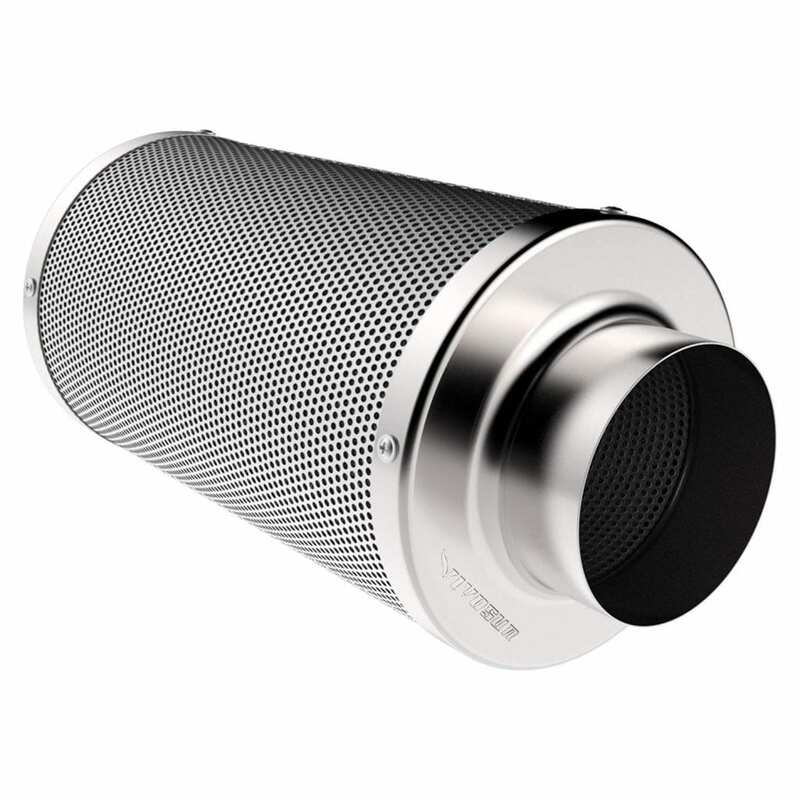 This, therefore, uses the iPower as an intake filter or as an exhaust filter. Some of the positive assets of this product are that it is made of good quality aluminum for better longevity and also has a reversible base and a flange for a longer usable life. The negative aspect of the filter is that it is sometimes difficult to fit the carbon filter. 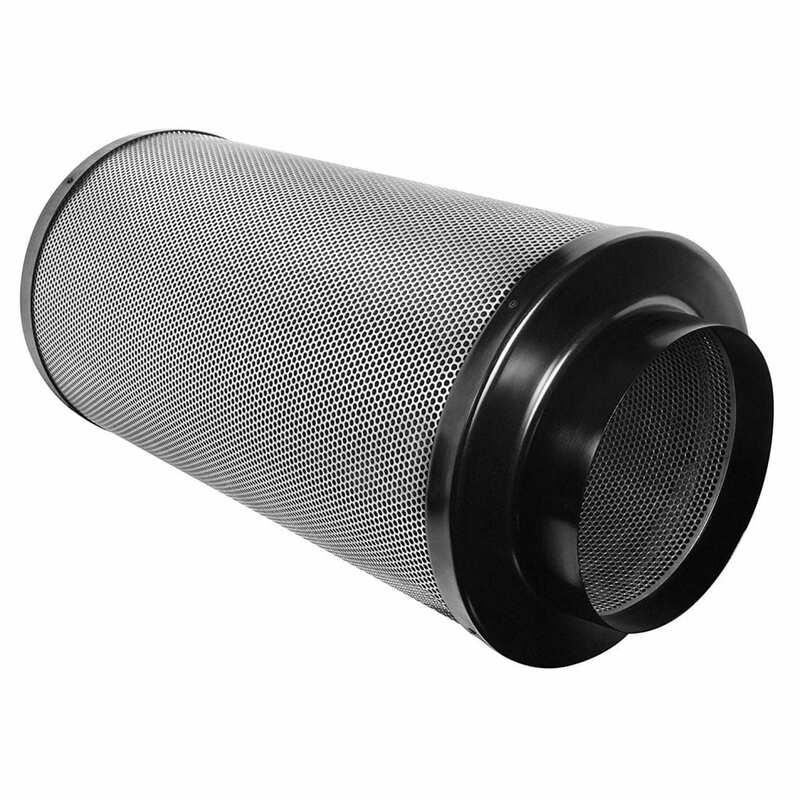 We personally think that this is one of the best carbon filter in the market. From the name itself, you must be wondering where it hails from and if it works good. Well, as per market research, it is one of the highly rated carbon filters in the market. Not only will it clear the foul smell in the grow room; it destroys the foreign particles, dust, and other organic compounds. This is thanks to the machine it has been packed with; The Australian virgin charcoal. This type of filter has washable pre-filters and elastic bands that can be easily mounted around the carbon filter. 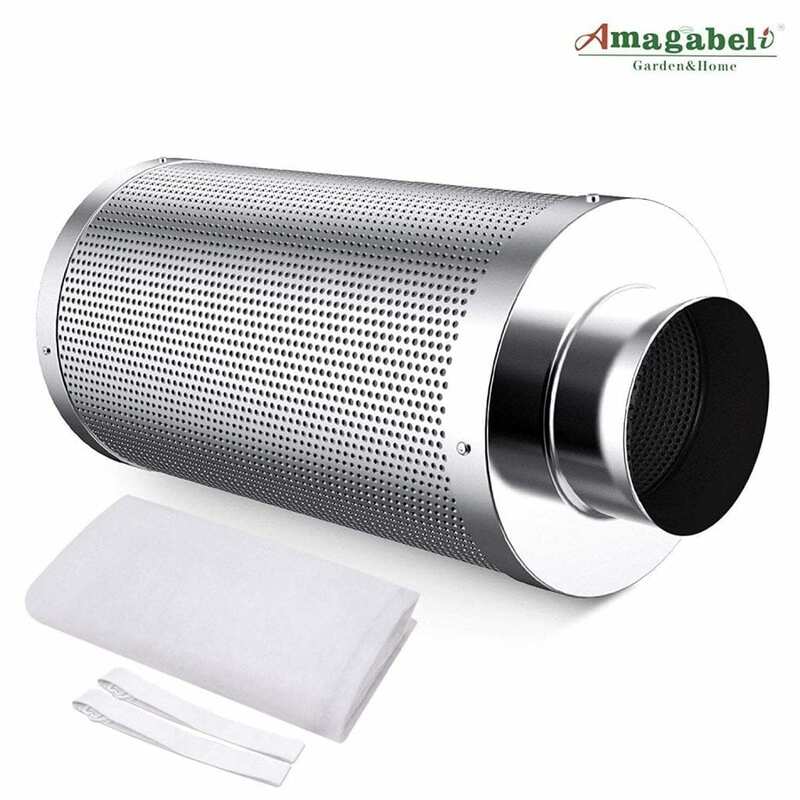 Its charcoal design ensures maximum absorption to improve the longevity of the filter. Their filters tend to last longer compared to other brands. In the part of durability, the filter is heavy duty and compact in every possible way. As a result, most people will get the filter to be heavier than expected. 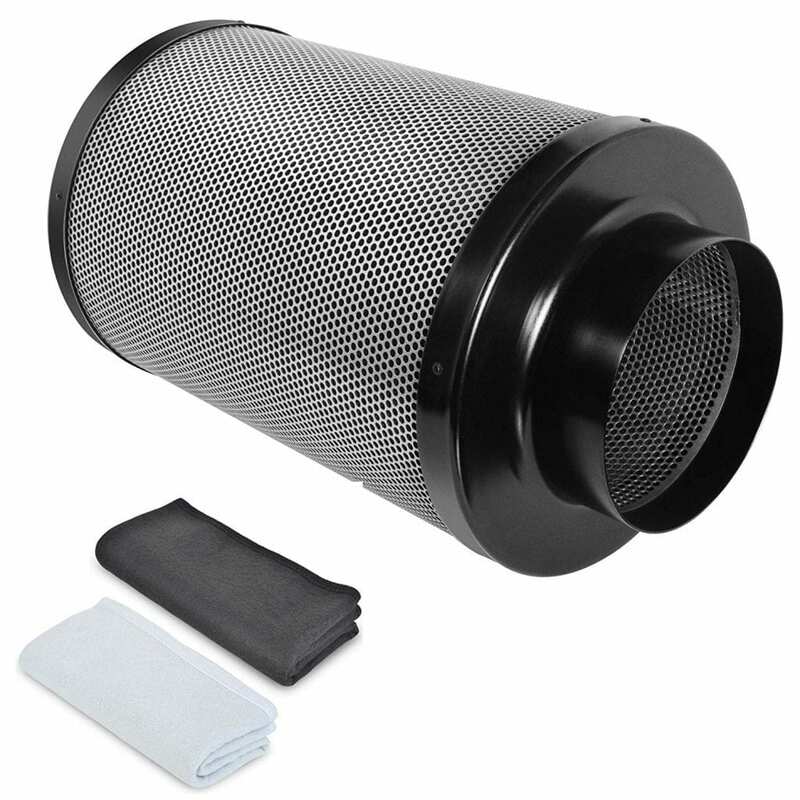 This filter is however not super expensive and can be used both as an intake or exhaust filter. The only con to this amazing filter is that it is quite heavy. We think this is a filter that you should definitely consider as an option. In most cases, the filter is always compared to the Phresh carbon filter. Both come with a pre-filter wrapped around the unit to ensure that the air passing through the unit is properly cleaned. This helps in prolonging the life usability of the charcoal inside the unit. In comparison to the 4-inch version, the 6 inch is a larger size. The dimensions, however, are not much of a problem. You can go for a 4-inch, 6-inch or 8-inch version of this filter. The bigger your grow room, the bigger your air carbon filter needs to be. Its body is made of galvanized steel and very high-quality charcoal so that it can either be used as an intake filter or exhaust carbon filter. The good thing about it is that it comes with guides on how to install the filters in different ways. It is a somewhat affordable option among the carbon filters. However, its overall performance is solely based on its general reviews from the users and performance. The cons on this filter are a bit more to its functionality. For one, the filter is likely to fail too early, and it may not be completely suitable for inline fans. This type of carbon filter has a carbon bed that is approximately 46mm thick. The machine has small granules packed within it. This gives it 15% more carbon than what can be obtained with the 38mm carbon beds in other types of filters. The tiny pellets also make the packing inside the filter to be tight hence minimizing movement in the filter. Having fewer pockets in between the granules, the filter tends to get improved performance in the filtration process. The Terrabloom 8 inch premium carbon filter is made with the RC-48 Grad Australian Carbon. This is high quality compared to other filters that use larger carbon pellets. 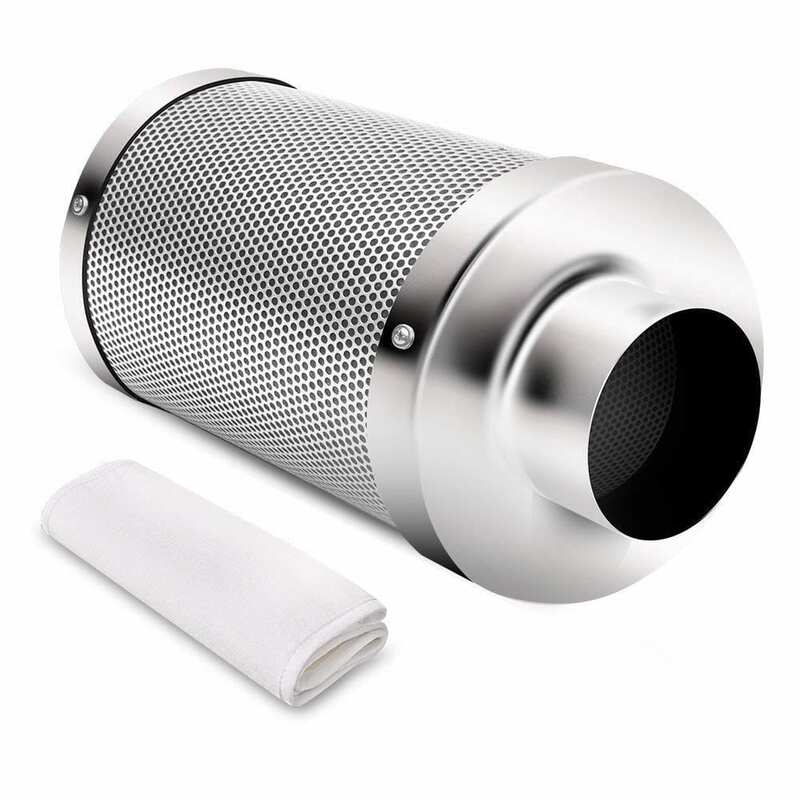 The carbon filter is used to filter out plant-based allergens and other disagreeable odors. It can last up to 24 months and is rated to have up to 200 CFM. The filters main pro is that it has an effective filtration system and a longer lifespan than most carbon filters. Some of the drawbacks include not being as effective in clearing of the odors as other filters, and one might generally have to install a clamp to make it operate silently. True to form; however, the manufacturers offer a 90-day warranty against defects, which show how much they believe in their carbon filter’s quality. The activated charcoal carbon filter is a type of filter of which the charcoal has been treated with oxygen. This opens up a lot of tiny pores between the carbon atoms. This method is hence also referred to as carbon filtering. Each granule of carbon provides a large surface area allowing the pollutants particles to maximum exposure to the existing sites within the filter media. The activated charcoal is good at trapping other carbon-based impurities as well as things like chlorine. The filter has a life expectancy of 1.5 years and has a reversible flange and base intended for extended service. It is made up of the 1050+ IAV Australian Virgin Charcoal, which is one of the world’s most absorbent charcoals. Its pre-filter that is included is to be replaced every 6 months to protect the filter. It has a carbon layer that measures up to 50mm thickness hence absorbing and eliminating most of the undesirable odors and additional harmful chemicals. This carbon filter is the same as its 4 inch version, but bigger and intended for use in larger grow rooms. Concerning the various carbon filters that exist in the market today, the mentioned filters are the best when it comes to a good carbon filter for weed. The filters are not as outstanding or remarkable as the new generation carbon filters. The main improvement is the use of carbon. This creates the best carbon filter for your grow room that is available at the moment. A primary weed breeder needs the filters for the plant allergens that pollute the place. Hence, a grower will need the best carbon filters there are in the market. The iPower carbon filters take the lead in the best carbon filters for weed grow rooms. This is because of its outstanding properties in the working system of the filters. Also, you have a lot of options in size with the iPower. The Amagabeli comes at a close second since its working mechanism is more like that of the iPowers with great filters implemented. The Australian charcoal used as the pollutant extract and the dual capability of the filters are great in this carbon filter. If you require the best, you have to spend money; but for the ultimate best the named filters will be our recommendation. Don’t forget that if you are looking for cheaper options, the other filters are great ones as well. Although, you have to keep in mind that you will be getting lower results in terms of odor control. Are you looking for a grow tent to optimize your grow room control? Check out our reviews on the best 3×3 grow tents and the best 4×4 grow tents. 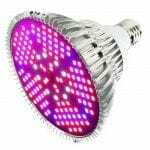 We have also reviewed a lot of LED grow lights. We included a few recommendations for you to read: the GalaxyHydro 2000w, Dimgogo 1000w and the MarsHydro ECO 600w. You have to control the odor in your grow room and prevent this from leaking out. We tell you how to do this with a carbon filter and what to look for in a great carbon filter. This article covers reviews of the best carbon filters available in the market.